Time management training – not as hot as it used to be? 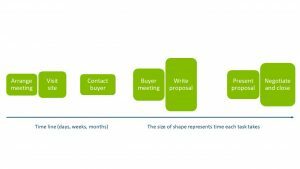 Is the current paradigm of time management in sales all wrong? Has anyone else noticed that time management training is not as hot as it once was? It seemed like personal organisers, urgent / important, daily goal setting were all the rage a few years back. If it has reduced, it can’t be because there is less need for time management now: With ever more distractions in the digital world, surely we need it more than ever. And why do I still hear sales directors being surprised that their sales teams don’t like the ‘6 calls a day mantra’? Customers want their needs to be fully considered with personalised offerings, making each ‘sales process’ different. They expect things to be done quickly. The competition is tough out there and sales people have to be trusted, distinctive and valuable. What are the implications of this for managing a sales pipeline? Each job would look different, a bit like building a house to order. Now imagine trying to manage several sales processes at the same time. How easy is it for a sales person to conveniently schedule these activities? If we apply lean process thinking to this task, it can offer some interesting insights. Right first time: We discover exactly what will float our customer’s boat and make it happen. No waste: We get the job done as efficiently as possible. Kanban: As soon as one stage of the sales process for one customer is complete, we get on to the next customer job. Lean thinking and Kanban systems have been repeatedly shown to improve operations for the customer and the supply organisation. Higher close ratio as we deliver exactly what will wow the customer first time. 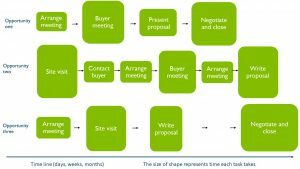 Shorter sales cycles because we do our bit of the sales process as soon as we possibly can. However, applying these principles has two consequences that do not appear attractive to managers or sales people with traditional thinking. Firstly, for the sales person, it means evening and weekend work as a regularity to reduce delays. Hour are variable, depending on the amount and timing of sales opportunities. For the manager, this means accepting on some days, the sales person works less than 8 hours per day. This is a unique feature of the Kanban system: Sometimes workers are sat idle, however, throughput is optimised. The quality and quantity of opportunities. The priority tasks to keep the opportunities moving. Whether to kill an opportunity which is a “no hoper”. Because of the variable, dynamic, emergent nature of sales opportunities, trying to manage them with “x calls per day” logic will not work. We have to hold people accountable for the output, and coach them well on regular pipeline management. As much as the opportunities are individual, companies can help their sales teams through good proposal templates, customisable product presentations etc. Help sales people understand the principles of lean thinking and how it can be applied to sales. When customers get right first time inputs delivered as quickly as possible, it has two profound effects: Firstly, trust is built through “doing as you say you will” and secondly, it conditions customers to expect excellent service with your organisation as the one showing them how. This has to be a true competitive advantage, and a wise investment in time indeed. « Is there an element of luck in sales?